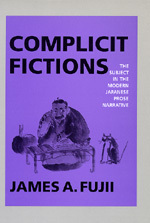 In Complicit Fictions, James Fujii challenges traditional approaches to the study of Japanese narratives and Japanese culture in general. He employs current Western literary-critical theory to reveal the social and political contest inherent in modern Japanese literature and also confronts recent breakthroughs in literary studies coming out of Japan. The result is a major work that explicitly questions the eurocentric dimensions of our conception of modernity. Modern Japanese literature has long been judged by Western and Japanese critics alike according to its ability to measure up to Western realist standards—standards that assume the centrality of an essential self, or subject. Consequently, it has been made to appear deficient, derivative, or exotically different. Fujii challenges this prevailing characterization by reconsidering the very notion of the subject. He focuses on such disparate twentieth-century writers as Natsume Soseki, Tokuda Shusei, Shimazaki Toson, and Origuchi Shinobu, and particularly on their divergent strategies to affirm subjecthood in narrative form. The author probes what has been ignored or suppressed in earlier studies—the contestation that inevitably marks the creation of subjects in a modern nation-state. He demonstrates that as writers negotiate the social imperatives of national interests (which always attempt to dictate the limits of subjecthood) they are ultimately unable to avoid complicity with the aims of the state. Fujii confronts several historical issues in ways that will enlighten historians as well as literary critics. He engages theory to highlight what prevailing criticism typically ignores: the effects of urbanization on Japanese family life; the relation of literature to an emerging empire and to popular culture; the representations of gender, family, and sexuality in Meiji society. Most important is his exposure of the relationship between state formation and cultural production. His skillful weaving of literary theory, textual interpretation, and cultural history makes this a book that students and scholars of modern Japanese culture will refer to for years to come. James A. Fujii is Associate Professor of Japanese at the University of California, Irvine.